The new Secretary of State John Kerry has proposed $60 million in aid to the Syrian Opposition Council in order to provide basic services in areas they control as well as medical and food supplies for their military. This announcement was met with skepticism by some backers of the Syrian opposition affiliated with the secular forces and also by a number of military and Middle East experts. Farid Ghadri, leader of the Syria Reform Party and a secular supporter of the Syrian opposition, has been arguing that "since the bulk of the opposition, the one recognized by the United States, is dominated by the Islamists the funds will be used by the Muslim Brotherhood and the Salafists to ensure a political influence in the zones controlled by the rebels." Over the past few months, other opposition leaders, including former MP Ma'moun Homsi who attended the opposition conferences in Turkey and Egypt and worked with the Muslim Brotherhood, told us "if Washington earmarks financial help strictly to the Brotherhood, they will get a Brotherhood dominated Syria after Assad." Homsi, himself a conservative Sunni blasted the Brotherhood on December 12, 2012 for being "authoritarians." Sherkoh Abbas, chairman of the Kurdish National Assembly of Syria said "it seems that the US Administration did not learn from past experiences with the Taliban in Afghanistan." He argued that by granting millions of dollars to mostly Islamist leaders of the opposition Washington will be responsible for the rise of Taliban-like groups in Syria. The Muslim Brotherhood and the Salafists are fighting the Assad dictatorship to replace it with a Jihadi totalitarian regime." He added: secular and moderate Syrians, Kurds and Assyrian Christians won't see much from that aid, it will fall into the hands of Salafists who are the foot soldiers of al Qaeda." In my book The Coming Revolution: Struggle for Freedom in the Middle East that predicted the upheavals in 2010, I argued that whenever a dictatorship might fall, particularly in Syria, there will be a race between Islamists and secular reformists over the future of the country. It would be toxic for the free world to willingly arm and fund the Islamists, including the Salafists, for they will work on using this support to impose an Islamist regime instead of a liberal democracy. 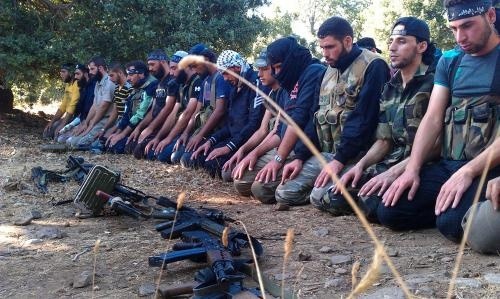 The decision by the Obama Administration to fund the Brotherhood-dominated opposition in Syria with $60 million dollars will further the cause of the Islamists and empower them while doing nothing to promote freedom in that region of the world with the secular democratic forces in civil societies. Military and terrorism experts also agree that this funding is a strategic mistake. An unnamed specialist in the study of insurgencies and counter insurgencies said: "How are we going to ensure that the "good guys" are distributing this aid instead of jihadists, in general, and al Nusrah in particular, not taking credit for it?" The source explains: "Although initially a nationalist movement in spirit, the dynamics of the revolution have changed. Most of the effective military actions have been carried out by the experienced jihadists whose numbers are growing as this becomes the new Iraq of 2006 for al-Qaeda. Perhaps most importantly, though, the Syrian National Council/ Syrian Opposition Council expressed their support for the al-Nusrah front immediately following the U.S. designating al-Nusrah a terrorist entity. So we are aiding a group which supports al-Nusrah (an AQ franchise) while we continue to prosecute a war against AQ? What do we define as success in Syria? The removal of Assad is only partial success. The removal of Assad and emplacing an Islamist regime with access to chemical weapons is an utter failure." This stark warning from experts in counter-terrorism who have worked in the field should be heeded. Washington is funding an umbrella group backed by Qatar and the AKP Government of Turkey. While there are secular elements inside the coalition, the leadership, the command and control of the operations, is held by the Jihadi Salafists, connected to al Qaeda. As in Libya, the Administration is indirectly empowering Jihadists who will not hesitate, once they are in control, or free to operate training camps, to strike against U.S. targets, let alone against secular democrats. Benghazi must not be repeated. The Obama Administration should not fund or arm a group controlled by the Islamists and justify its move as support of rebels. It did not work in Egypt politically, and it was a bloody disaster in Libya last September. Instead, the Administration, along with its international partners, should organize a conference where all components of the Syrian opposition, not just the Islamist-controlled ones, will be present. Also, the secular military commanders of the Free Syria Army should be present and understood by the international public community. Only then should we trust a reformed leadership of the Syrian opposition, pledging the future of Syria to a secular liberal democracy, with our dollars or Euros. For by all projections, as Syrian liberal dissidents and Western military experts agree, the millions of dollars spent on Islamist opposition movements will boomerang back against Americans and the free world if in the hands of the Jihadists.